A rare blend of Scotch and Japanese whiskies has proven so popular that its makers have released a third version. The Glover 18 is the third in a series of whiskies honouring ‘Scottish Samurai’ Thomas Blake Glover and celebrating the long history of trade and friendship between Scotland and Japan. Its owners, Edinburgh-based TBG & Co, say the new edition has already attracted a “very promising” number of international orders prior to today’s international launch. The whisky brand takes its name from Thomas Blake Glover, nicknamed the Scottish Samurai because of the profound impact he had on the modernisation of Japan in the 19th century. Glover was the first foreigner to receive the Order of the Rising Sun from the Japanese Emperor in recognition of his many achievements. TBG & Co has confirmed it is now looking towards producing future variants with whiskies from other countries, with the team researching historical characters and options for casks from international single malt distilleries. Director David Moore, an Asia veteran in the drinks sector and now Scotland-based, comments: “We knew the idea behind The Glover was a strong one, but we're still overwhelmed by the international interest the fusion whisky garnered, both for its concept as well as its look, aroma and taste. The first two editions sold out almost immediately and were heavily over-subscribed, finding their way to 15 international markets." "It's clear there's a strong market for these types of premium fusions between Scotch whisky and international whisky, which have their own unique character. 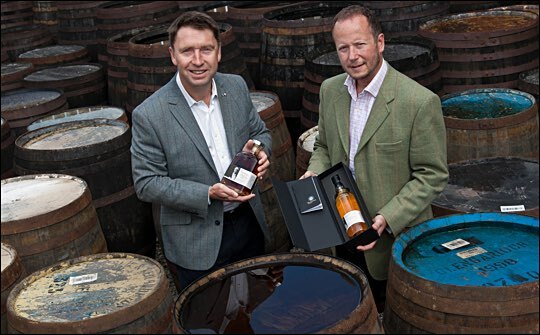 Moore highlights the ongoing relationship with the Fife-based premium bottler Adelphi, whose managing director Alex Bruce blended mature whisky from Longmorn and Glen Garioch distilleries in Scotland with exceptionally rare whisky from the legendary Hanyu distillery in Japan to create the Glover fusions: “There are only a handful of Hanyu casks left in the world. For the Glover, Alex has worked his magic with this highly sought-after whisky to hone and perfect a beautifully balanced and sublimely satisfying dram." He also says TBG & Co is looking at funding options from Scottish Development International and Scotland Food and Drink, and that the company is also looking to appoint a project manager to oversee current operations, with the likelihood of additional employees further down the line as the business grew. He adds: “Creating international fusions is not without its challenges, but the rewards are clearly there for people to see and taste. These whiskies are a celebration of Scotland's internationalism, of its positive influence on other countries, of partnerships that reach across physical borders". “We think it's worth trying that little bit harder to create these fusion whiskies, a drink that was made for sharing with friends. The Glover 18 is likely to be exported to more than 15 countries, including a significant amount to Japan. Domestically, previous editions of The Glover sold in luxury retailers Harvey Nichols and Harrods, as well as specialist whisky shops.